Platinum has a polished sound to it. But at Mountain Equipment Co-op’s new headquarters in Vancouver, British Columbia, platinum looks a little more rugged. 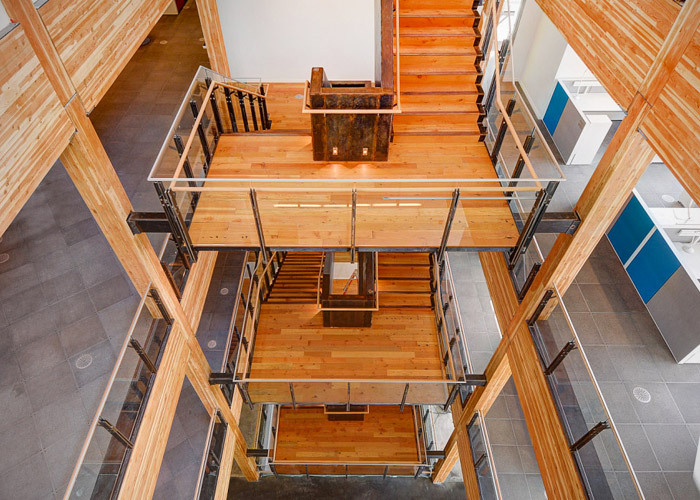 The fresh HQ structure in the heart of downtown’s popular live-work-play False Creek Flats neighborhood was designed to achieve LEED Platinum certification while embracing all things natural, environmentally focused and, well, mountain-esque (this is a company that invites its customers to engage with the outdoors, after all). 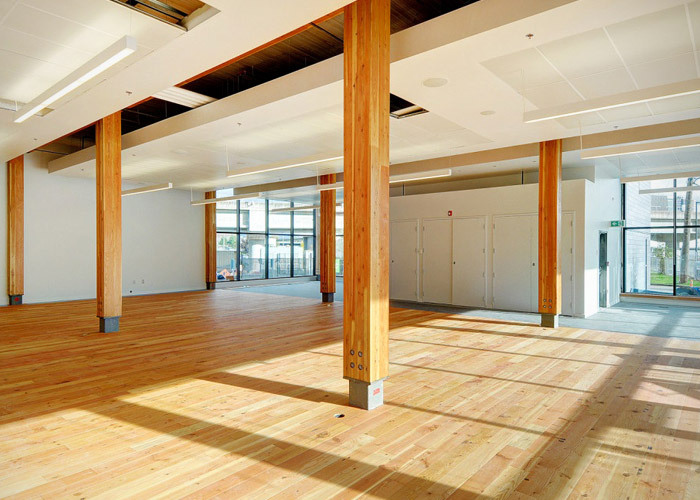 The new 112,000-square-foot facility gave this well-loved Vancouver business a new home that fell within the company’s sustainability agenda. 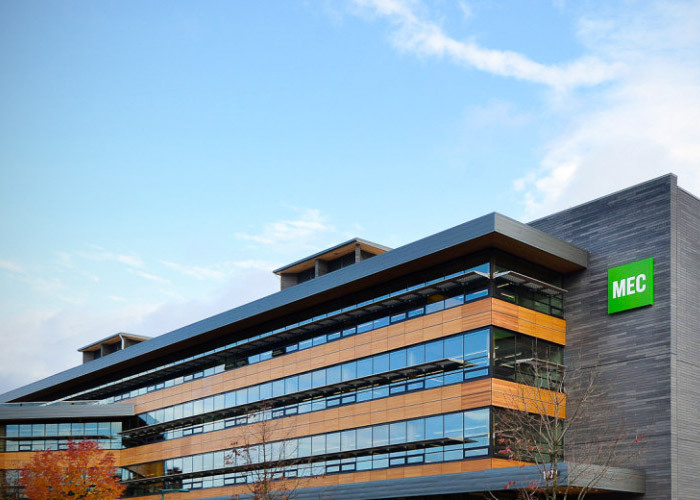 Heavy timber, advanced lighting and air-control systems and a design meant to maximize natural light help the headquarters to operate 70 percent more energy efficient than a conventional office building, according to Proscenium Architect and Design Firm. Along with the hefty use of wood and steel, there’s plenty of glass to help the natural light invade the interior. Inside, a feature stair links individuals and workgroups within the building, designed to enclose private work areas around the center spine. Open work areas along the building perimeter allow workers to enjoy the natural light and views of downtown Vancouver. To match the nature-focused design, Lynden Door provided durable and stable painted hardboard doors. Designed with a uniform finish from the Lynden Door plant to keep them easy to maintain, MEC was able to select from a variety of finishes that met the exact design desires and mesh the interior doors with the rest of the architecturally fresh MEC headquarters. 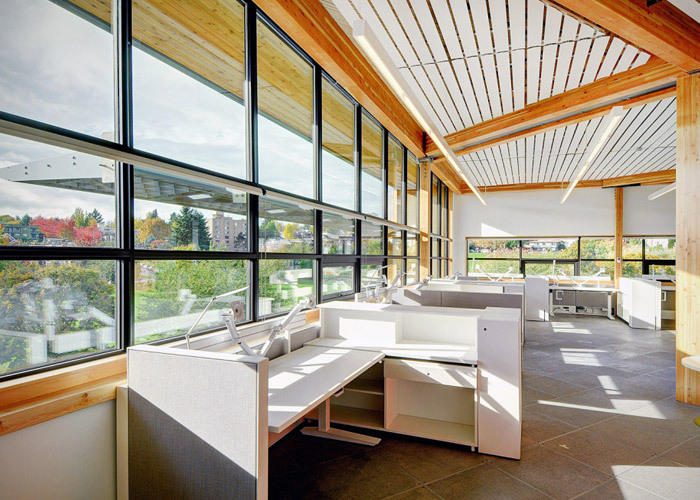 Of course, a few extras, such as a rooftop greenspace and garden, multi-purpose areas and a bouldering wall, help give MEC’s headquarters a little bonus touch. To help with the live-work aspect of downtown Vancouver life, the office was located near transit, along a greenway and across from a park so employees could bike/bus to work—basement bike storage holds over 120 bikes—and use the park during the day. It all adds up to platinum, Vancouver style. Durable and stable, Lynden Door Factory Finished Hardboard doors arrive ready to install with a professionally applied, uniform finish that will keep them attractive and easy to maintain.